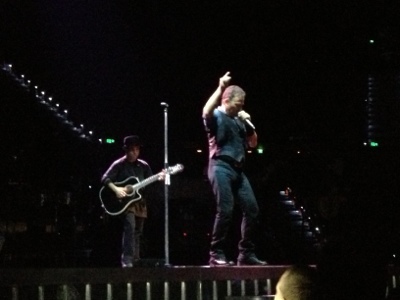 The second stop on the Australia tour was the perfect example of how no two Springsteen shows are ever the same. Five out of the first nine songs were different from the previous Brisbane show two nights earlier that kicked off the tour. The start was a pumping version of High Hopes, replacing the previous show's opening song We Take Care Of Our Own that wasn't even played. 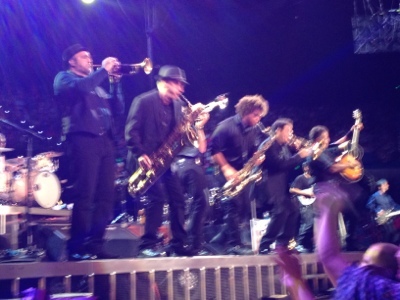 What fans received on night two was a continuation of the renewal of E Street Band folklore that Springsteen plugged to media during a soundcheck ahead of night one. An incredible Incident on 57th Street was a lengthy, enjoyable surprise. As was the acoustic version of Blinded By The Light to satisfy the girl in the blue dress that Springsteen said he'd spotted earlier and thought was cute. Other exciting changes were brought on with the collection of fan-made request signs - something he hadn't done on night one - and which led to a brilliant rendition of Open All Night. Spirit In The Night made it's second welcome appearance and along with Tom Morello's fiercely influenced Ghost of Tom Joad are the recurring highlights from two nights on the tour. If there was one disappointment it was at times the sound seemed to be a little distorted from the guitars of the band. Death To My Hometown started great, but the final few minutes was a distracting mess of feedback between Nils Lofgren, Springsteen and Morello. A fault which I feel Lofgren felt was there. Standing in front of him and Soozie for the night I could see him frequently swap guitars, fiddle with pedals and signal the mix desk more times than I've ever seen him before. Aside from that however were of course some incredible highlights. Atlantic City sounded incredible and The River too was an excellent surprise as the first few bars on the harmonica were met with a roar of the crowd. Brisbane part two also had the pleasure of Land Of Hopes And Dreams - performed superbly before the encore that included Bobby Jean amongst it's final efforts. A night that spanned the decades of E Street Band including Springsteen's first single is not one to be dismissed - even if it may have lacked the punch and power of the previous show with no Thunder Road or Glory Days. Heading to Sydney for Monday night - I have no idea what to expect but cannot wait for the next blast from the past. A 12 hour train journey along the east coast - I'm revising my history to some of E Street's earlier works... I've got a feeling Kitty could be back with Rosalita any day now.